The highly trained technicians from Handy Auto Glass are experts you can rely upon for repairing or replacing your cracked or damaged car or truck window. 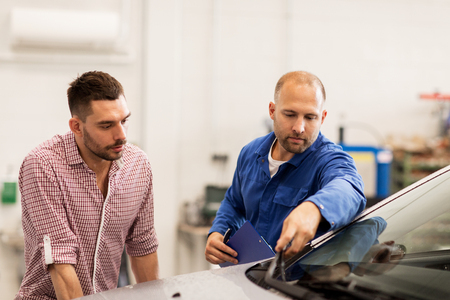 Specialists go through extensive training including classroom work and in-shop apprenticeship in order to become certified technicians qualified to service your motor vehicle. All installations meet the requirements of the Auto Glass Replacement Safety Standard of the Federal Motor Vehicle Safety Standards (FMVSS). Only the best quality materials are used in completing the repairs. Choose the top notch service personnel and high grade parts and supplies available from Handy in Miami. Mobile service offers a convenient alternative to an in-shop visit for windshield repair. Technicians from a nearby service center will drive to your location and service your vehicle where it is parked. Some full window replacements will require an in-shop visit and mobile repairs may be subject to weather conditions. Repairing auto glass is a less expensive alternative to replacement and is the first solution investigated when service is required. When the damage is about the size of a credit card or less, the window may be eligible for repair. While repairing is meant to extend the life of a car window, it does not eliminate visual obstruction caused by damage, so rock chips or cracks in the driver’s line of sight will generally require replacing a windshield. Left unrepaired, small rock chip cracks can spread from road vibration and fluctuations in temperature. When a windshield needs replacement, the technician will first remove the plastic molding around it, saving any undamaged holding clips; then the glass is cut away from the pinch-weld – the welded area that frames the front window. Urethane adhesive bonds the glass to the car and slicing through the urethane enables technicians to lift the windshield off the vehicle. In order to put in a new windshield, the area to be glued needs to be cleaned and prepped, and tape is laid down to protect the car during the application of a rust inhibiting primer. A urethane primer painted on the black frit band around the perimeter of the front window helps the urethane adhesive form a stronger molecular bond. Urethane adhesive holds the glass in place and fresh adhesive takes some time to set and form a strong seal. A windshield gasket and trim fill in the gaps around the edges of the glass. 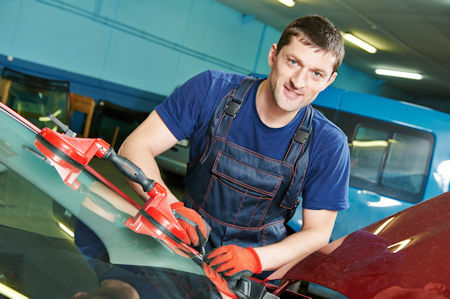 For windshield replacement Miami drivers should call Handy for convenience and reliability. A broken side window opens the way for rain, snow and dirt to enter your car or truck and also presents a security hazard. Temporary covers do little to prevent opportunists from taking valuables or targeting the theft of your vehicle. Contacting us offers an easy solution to making your vehicle whole again. All repairs start with a thorough assessment of the damage. If the glass needs to be replaced, the door panel is detached and remaining glass is extracted. Glass inside the cabin of the vehicle is cleaned up and vacuumed and new glass is installed in the door. The window mechanism gets tested and raising and lowering functions are evaluated. The door is reassembled and a final test and cleanup finishes the job. Similar to front windshield replacement, rear windshields that need replacing have to be cut out of the car or truck frame and then extra weather stripping and left over urethane needs to be cleaned away. Exposed metal requires anti-rust primer and the rear windshield frit needs urethane primer. Urethane adhesive is used to bond the auto window to the metal frame and the last step is adding back gaskets and trim. Contact us in Miami for a quote if you need a replacement. While the word windshield suggests that the glass at the front of the driver just serves to block the wind, equally important functions are to keep a clear line of site for driving and provide structural support to the cabin of the vehicle. Different makes and models of vehicles offer different features to keep the front car glass easy to see through. Beyond windshield wipers and blowers that defog the inside glass surface, some vehicles now include rain sensors, hydrophobic coatings and shade bands. A crack in the glass can compromise the strength of the cabin structure, a safety concern in the event of a rollover accident. The passenger airbag relies on the integrity of the glass because the airbag is designed to bounce off the windshield in front of the passenger. Laminated glass was invented by accident in 1903 by the French chemist Edouard Benedictus when he knocked over a glass flask that had become coated with a plastic; the flask broke apart but the pieces stayed contained due to the coating on the flask. Today laminated safety glass protects drivers and passengers from sharp flying shards if a vehicle window gets hit by a flying rock or the car or truck has a collision. 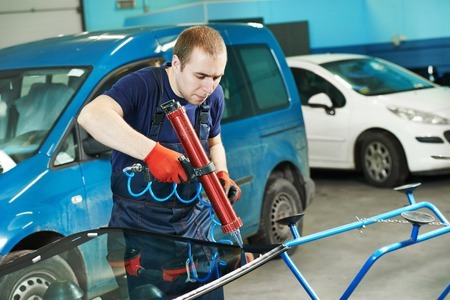 To manufacture a windshield, two layers of tempered glass are sandwiched over a layer poly-vinyl butryal (PVB) and then heated and pressed together with rollers. 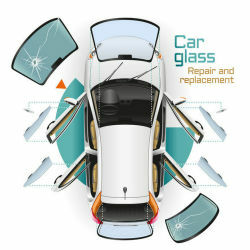 In a finished windshield, a shaped slab of laminated safety glass may be fitted with moldings, attachments and sensors, like light sensors, multi-use antennas and rain sensors. Rear windshields and side glass, including vent glass, quarter glass and sliders, plus moonroofs or sunroofs, are made of tempered glass, although some makes and models of vehicles use laminated safety glass. Tempered glass acquires its strength in the manufacturing process through a sequence of heating and rapid surface cooling which causes the surface of the glass to develop compressive stresses and the interior tensile stresses. Tempered glass can exhibit five to ten times the strength it originally had before tempering, and when it breaks it shatters into small dull pieces. Your work may be covered by insurance. One of our team members will contact your insurance company to determine coverage and will submit the required documents for filing a claim when possible. Your in-shop visit is a simple matter of describing your glass issue to a service manager. A technician will then assess the damage and recommend a course of action with an indication of how long the repair will take. Most of the time same day service takes from one to four hours. All work is guaranteed. Our focus on quality and professional service makes Handy the best choice for Miami drivers. All Rights Reserved. All locations are individually owned and operated.